Charity Mupanga is the widowed owner of Harrods International Bar (and Nightspot), a favourite meeting place for the movers and shakers of Kibera. While she can handle most challenges, from an erratic supply of Worcestershire sauce, the secret ingredient in her cooking, to the political tensions in East Africa's most notorious slum and a cholera outbreak that follows the freak floods in the state of Ubuntu, some threatening letters from London lawyers are beginning to overwhelm her. Well-meant but inept efforts to foil the lawyers by Edward Furniver, a former fund manager who runs Kibera's co-operative bank and who seeks Charity's hand in marriage, bring Harrods International Bar to the brink of disaster, and Charity close to despair. 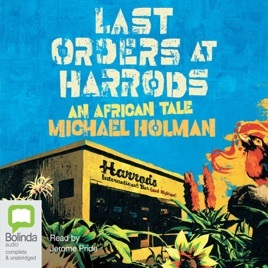 In the nick of time an accidental riot, triggered by the visit to the slum of World Bank President Hardwick Hardwicke, coupled with some quick thinking by Titus Ntoto, the 14-year-old leader of Kibera's toughest gang, the Mboya Boys United Football Club, help Charity - and Harrods - to triumph in the end.